On November 12, 2009, the Royal Australian Mint unveiled the new Burke and Wills Expedition coin designs. The designs were unveiled at the Burke and Wills display at the State Library of Victoria in Melbourne, Australia. “It is fitting to launch these coins in Melbourne as the Burke and Wills expedition departed almost 150 years ago from a site not too far from where we stand today,” said Assistant Treasurer Senator Sherry. The new coins are dated 2010, which marks the 150th anniversary of the Burke and Wills expedition. The 20c and $1 coins highlight the beginning and the end of the expedition. 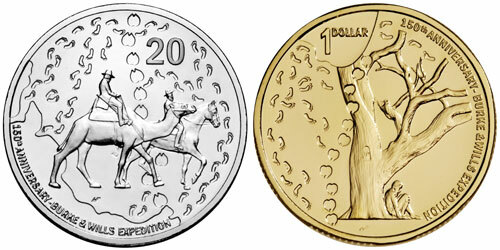 The 20 cent coin depicts Burke and Wills on camel and horse, departing for their journey. The $1 coin portrays the weary remaining sole survivor of the expedition, resting under the carved dig tree on Cooper’s Creek in southwest Queensland. Camel tracks across the coins represent the south to north traveling route and footprints represent the aid of the Aboriginal people and the Indian, Afghan, and Pakistani cameleers. The 20 cent coin is struck in cupro nickel with a weight of 11.3 grams and diameter of 28.52 mm. The $1 coin is struck in aluminum bronze with a weight of 9 grams and diameter of 25 mm. Two coin sets are available from the Royal Australian Mint in uncirculated or proof finish. The two coin uncirculated set is priced at AU $15.00 and the two coin proof set is priced at AU $45.00.